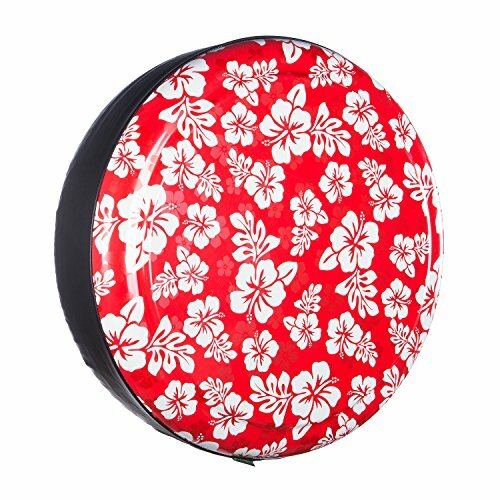 Boomerang® Hawaiian print Rigid tire covers add tropical flare to your vehicle and are available in many custom sizes. Boomerang® Rigid tire covers are premium plastic face tire covers built to last. The tread is covered with a durable automotive-grade soft vinyl band that is stitched to the heavy duty, molded face plate. Available in many sizes to ensure a perfect fit. You will love the easy installation, superior protection and upscale look a Boomerang® Rigid Tire Covers will add to the rear profile of your vehicle. This item is backed by the manufacturer 3 year limited warranty. An optional lock kit is available for $19.95 (must be ordered with the tire cover). PLEASE CONTACT US IF YOU ARE UNSURE OF YOUR CORRECT SPARE TIRE SIZE. We can help you verify the correct size tire cover for your vehicle.